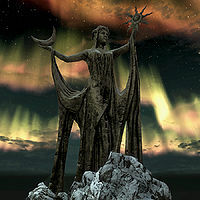 The Shrine of Azura is a statue dedicated to the Daedric Prince of dawn and dusk Azura. 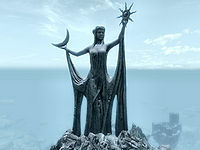 The shrine is tended by Azura's last remaining worshipper, Aranea Ienith. It can be found south of Winterhold on the summit of a tall mountain. The path leading to the shrine is found not far south of Whistling Mine and rises sharply to the west. To reach it, travel southeast along the path from Winterhold in the direction of Windhelm. If the weather is clear or if you use the clear skies dragon shout, it is possible see a long way in all directions. The shrine sits atop a stone fort-like structure that was supposedly built by Dunmer, who revere her. There is an altar in front of the massive statue, in front of this is where Aranea spends all her time worshipping when not following you. To the right of the altar on a level below is a small camp consisting of a small tent containing an unowned bed roll and a collection of crates and sacks containing food. Faldrus will join Aranea Ienith in front of the statue if you follow him there and he survives his pilgrimage to the shrine. Otherwise, he will disappear from the game after you leave him. This page was last modified on 12 May 2018, at 07:52.